While I have been living in Brisbane, I took a job for several months in the town of Mackay on the Whitsunday Coast on central Queensland. It was a great opportunity because I was provided with flights home every two weeks, accommodation, food allowance and a rental car. The car enabled me to not only get around the city but also explore the surrounding beaches and hinterland. I also took a weekend to go up to Airlie Beach and get out on a boat into the Whitsunday Islands. Mackay is essentially a town that caters for the agriculture and mining industries but it has some attractive art deco architecture and a pleasant setting beside the Pioneer River. The motel I stayed at was a relatively short walk from the pretty botanical gardens which has the river running through it. In the opposite direction near the city centre is the artificial Bluewater Lagoon which has lovely grassed picnic areas, fountains and a café. The town is a good base to do various day excursions from. The best of these trips is a drive west through the beautiful Pioneer Valley. I did this trip a few times and made sure that I took time to explore the secluded and very picturesque Finch Hatton Gorge. There are a couple of relaxed rainforest walks here to waterfalls and refreshing swimming holes. The highlight of the valley though is the Eungella National Park. It contains the oldest and longest stretch of subtropical rainforest in Australia and is serenely beautiful. Aside from the rainforest and amazing views back down the valley, the big attraction of the national park is the opportunity to spot the reclusive but very cute platypus. Broken River is one of the few places that you’ll ever see one in their natural habitat but it takes some patience and luck. After hiking a trail up the river, I returned to the viewing platform near the car park and joined a group of others who were silently waiting. Voices were in whispers but you could feel the anticipation. As dusk approached we were rewarded with the appearance of several platypuses. I spent several happy weekends at the beaches just north of Mackay and also made it to the Cape Hillsborough National Park. South of the city I took a day to visit the town of Sarina which has a beach and sugar cane museum. Not far from Sarina is the Hay Point coal terminal. From the viewpoint, I could see huge stockpiles of coal ready to be loaded onto huge ships that were waiting patiently off shore. Together with my friend Jen, we drove up to Airlie Beach as soon as I finished work one Friday afternoon. This high-energy little town has a steady stream of backpackers and other tourists who use it as a stepping stone to the Whitsunday Islands. The following morning we made our way along the pleasant boardwalk to Abel Point Marina to catch the island ferry. Our chosen destination for the day would be Long Island because it has the best of everything. Aside from the beaches, there are also about 13km of walking tracks that lead to some fine lookouts. Day trippers to the island can use the resort facilities so there was plenty for Jen to do while I went hiking. When I returned, we had a swim in the pool before getting the ferry back to the mainland. As the ferry arrived back into Airlie Bay I thought how I’d love to return to one day. The aqua blue ocean, secluded bays and white sand beaches make it the perfect playground and there are 74 islands that make up the stunning archipelago. Somehow, getting to just one of them doesn’t seem enough! Having been to the most westerly point of mainland Australia, the most easterly point of Byron Bay was added to my bucket list. So with my girlfriend and a rental car, we headed south for a long weekend. Before crossing the New South Wales border, we passed through the playground that is the Gold Coast beaches. At the centre of it all is the famous Surfers Paradise where the party scene is as much an attraction as the sand. Despite the name, the surfers are drawn to other beaches further down the coast but lifeguards are always kept busy with swimmers, especially on summer weekends. Tweed Heads marks the border between the two states at which point we turned inland and headed into the northern New South Wales hinterland. The undulating landscape down here is a blanket of lush rainforest, pastoral lands, orchards and eucalypt trees that are traversed by pretty winding roads. Our destination was the elaborately named Wollumbin-Mount Warning National Park and despite a few showers coming through the Gold Coast, our goal was to climb Mount Warning itself. Named by Captain Cook (to avoid the rocky Point Danger on the New South Wales coastline), Mount Warning was once the central magma chamber of a massive 4,000 sq km volcano. Today, the ancient caldera is known as a centre of spiritual energy and is sacred to the Aboriginal people. Much of the 4.5km hike to the summit (1157m) rises gently through rainforest but the final 400 metres is a boulder scramble using a chain to haul yourself to the top. We made the return hike in only three hours, but unfortunately the magnificent views were obscured at the top by thick cloud. 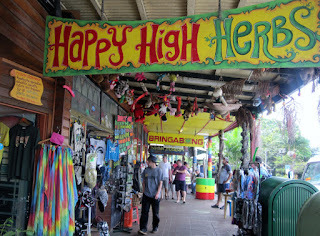 While in the area, we took the opportunity to visit the strange little town of Nimbin. 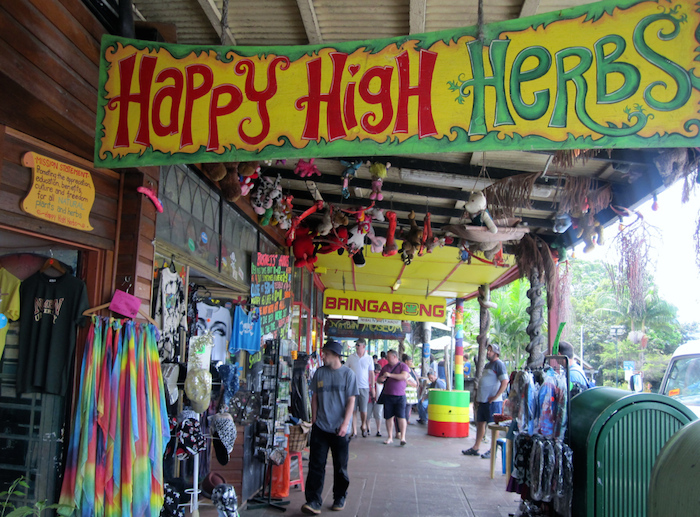 Since a music festival in 1973, Nimbin has been synonymous with hippies, marijuana and alternative lifestyle. The brightly coloured buildings along the quiet main street add to the unique vibe created by the people we met there. It has an interesting art scene where creativity often through marijuana. It’s not legal in Nimbin more than anywhere else in the country but police tend to turn a blind eye. So we sat down with a coffee and special cookie to enjoy the dreadlocked and tie-dyed world going around. We stayed the night in Lismore which is the hinterland’s main commercial centre. Sitting on the Wilson River, it has various heritage listed and art deco buildings including a hotel that Queen Elizabeth II once stayed at. After a look around the town we followed the walking track along the river back to the car and set a course for Ballina at the mouth of the Richmond River. It’s a reasonable size town that finds itself caught halfway between being a commercial centre and a tourist destination. Either way, it’s renowned as the home of the Big Prawn. Just north of Ballina, Bryon Bay doesn’t have any kind of identity predicament. With surf breaks, beaches, dining and nightlife, it is one of the premier travel destinations of the east coast. For even the cynical or travel weary, it’s hard not to be enamoured here and many find themselves staying longer than planned. Unfortunately our stay was limited to just the afternoon but we certainly made the most of it. The edge of Cape Byron is the most easterly point of Australia and we arrived here after following the walkway that ribbons around the headland. Towering over the cape is the historic lighthouse built in 1901. After having a look inside, we continued on the Cape Bryon Walking Track until it led us through the State Conservation Park and the picturesque Captain Cook Lookout. We stopped to visit a friend in Kingscliff near the Queensland border where he proudly showed me his ‘backyard’ of the northernmost beach in New South Wales. A wonderful couple of weeks disappeared quickly and it was time to head south to Brisbane. The Queensland capital shares its name with the Brisbane River that winds through the heart of the city. It’s an easy going place where green spaces, an artificial beach and historic buildings are woven into a modern urban landscape. There is a vibrant arts and sporting scene and when you add the temperate sub-tropical climate you have a few reasons why it has since become my home. The jewel in the Brisbane city crown is the lovely strip of lawns, rainforest and cultural attractions along the southern bank of the river. Southbank Parklands is a remnant of the World Expo in 1988 and there has recently been a 60m sightseeing wheel added. Southbank is bordered at one end by the Cultural Centre which is a sprawling area including the State Library, Performing Arts Centre, Queensland Museum and Art Gallery. On the other end is the Maritime Museum and I’ve taken time to visit all these fine attractions. The landmark across the river is the lavish old Treasury Building that is now the city’s casino. It marks the beginning of the Queen St pedestrian mall and a CBD where all the streets running north-south are English queens and those running east- west are kings. 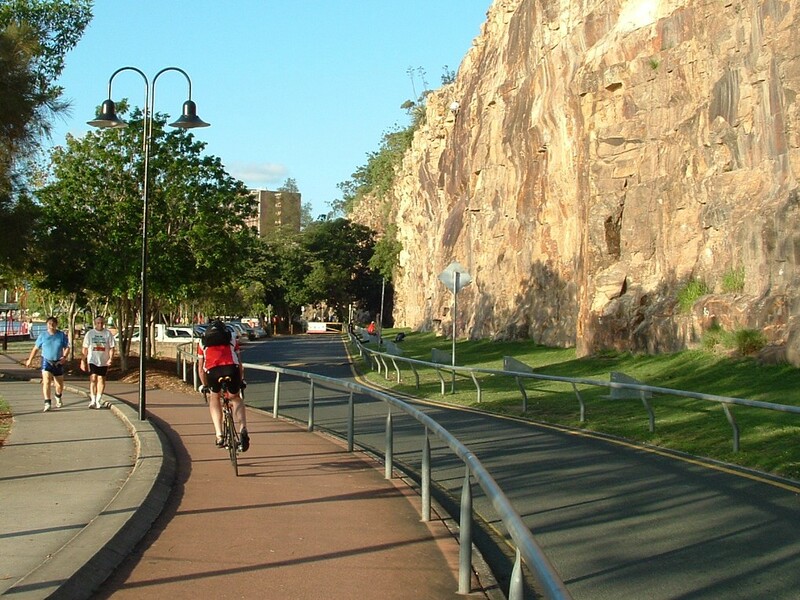 Brisbane has two botanical gardens, one of which is beside the river in the city and the other a short drive away at the base of Mount Coot-tha. There is a superb lookout on top of the mountain that offers views of the city and out to the Moreton Bay islands. Several significant bridges cross the Brisbane River but the most iconic of them is the Story Bridge which has recently celebrated its 75th birthday. Although I’ve crossed the bridge numerous times, I’ve never done the adventure climb that ascends to its highest points 80 metres above the river. There is a large network of cycle paths in the city including scenic routes that follow the river but there’s nothing quite like actually getting out on the water. Aside from the cruise boats, there is a large fleet of city ferries gliding the river every day so no excuses! The icon of Brisbane is the attractive 1930’s sandstone City Hall that proudly overlooks King George Square. It was closed to the public for a number of years because it required extensive restoration but it is now reopened with a magnificent interior. The observation platform up in the bell tower offers brilliant city views and tucked away in the same building is the Museum of Brisbane which showcases the history and cultural landscape of the city. A very short walk away is one of the world’s largest subtropical urban gardens, the lovely Roma St Parklands. When I was living in Cairns, I added the World Heritage listed Fraser Island to my Australian bucket list. Unfortunately this largest sand island in the world (120km by 15km) hasn’t been ticked off yet but I can at least say I’ve seen it. On a trip north one day we visited the Great Sandy National Park on what is known as the Cooloola Coast. This park actually includes Fraser Island that we could see from Rainbow Beach and there were also nice views from Carlo Sandblow which is a huge 120m-high dune. In was in the area that I decided to walk a 7km track along the path of an old telegraph line. It was late in the afternoon, starting to get gloomy and I was only wearing shorts and a t-shirt. I had about a kilometre to go when I lost the track. I tried to backtrack but suddenly I was disorientated and lost. Being winter, it was getting cold and I only had about 30 minutes of daylight left so I had to act quickly. I suddenly became very aware of how easy it would be to panic. All the trees looked the same and I couldn’t find any landmarks that I’d passed. From the map in my pocket, I knew there was a road to my right but after turning in circles I didn’t even know which way was right. In the end I had to gamble on my instinct. I began pushing through the bush either getting closer to the road or further from it. Thoughts of an utterly miserable night flashed across my mind until the bush suddenly opened out onto a rather bumpy old road. At the car park my friend was waiting patiently in the car for me. I’m not sure who was more pleased to see who in the end! For me, the highlight of the Sunshine Coast was our visit to the Glass House Mountains. Believed by Aborigines to be a family of mountain spirits, they are described by Lonely Planet as "13 ethereally shaped volcanic crags sticking up from the coastal plain". Small national parks surround six of these peaks. We visited three of them and also a lookout that offers panoramic views of all the mountains. Standing at 556m, Mount Beerwah is the highest peak in the park. While this elevation isn't exactly in the clouds, it’s a tough climb! The brochure we had reads: "Suitable for experienced rock climbers only. Routes that lead to the summit have steep rocky sections and irregular surfaces with loose stones that require rock scrambling and some rock climbing skills." They weren't kidding and it’s not for the faint hearted! We also climbed Mount Ngungun (253m) and I finished the day with a couple of walks around Mount Tibrogargan. As my flight touched down in Brisbane airport, I had a sense of satisfaction. It had completed the circle so to speak. I’d started over a year before on the east coast and from there had explored the length and breadth of Australia. Obviously there were far corners I hadn’t reached but overall I didn’t have too many regrets. I’d travelled many thousands of kilometres across a multitude of different landscapes. I’d experienced all kinds of weather and met all kinds of people. I imagined that after spending a few weeks in southeast Queensland and northern New South Wales my journey would be complete and I’d return to New Zealand. What I didn’t imagine was that years later, I’d still be there and calling Brisbane my home. I simply couldn’t resist the attractive climate and lifestyle of this beautiful part of the country and indeed the world. My arrival coincided with an invitation from a friend to help housesit for her sister in Coolum. So for two wonderful weeks we had a car to explore the lovely beaches and pretty hinterland areas of the Sunshine Coast. It was nice to warm up again also. After the cool autumnal temperatures of Adelaide, the average temperatures here are in the low 20's and we could swim at the local beach. The other thing I enjoyed here is Mount Coolum (208m) which offers bird’s-eye views of the town and other beaches along the coast. Arguably the best of these beaches is at gorgeous Noosa. The rainforest of the adjacent national park here seems to blend almost seamlessly with the beautiful stretch of sand and the fashionable boulevard of the town. It’s sophisticated and elite but at the same time relaxed and unassuming. I enjoyed the Noosa National Park as much as the beach. It covers the eastern headland that protects the beach and the bushwalks take in great coastal scenery and bays that draw surfers from far and wide. Other beaches are strung along the coast down to the town of Mooloolaba but we were also eager to get inland to enjoy the charming towns and native bush of the hinterland. Our visit to the quaint village of Eumundi was on a Saturday morning so we could experience the market that draws thousands each week. The 300-plus stalls selling a huge variety of arts, crafts, clothing, food and alternative healing products create a relaxed vibe and I would have been happy to stay longer if we didn’t have some bushwalking planned for the afternoon in the rainforest of the nearby Mapleton Falls National Park.